When you buy a home, it’s more than just the house itself, you’re really buying into a lifestyle, and becoming part of a community. The Ottawa and surrounding area has a lot to offer and there may be “hidden gems” that you hadn’t considered. We’re excited to introduce a new series of blog posts dedicated to giving readers the inside scoop on some great Ottawa neighbourhoods, starting with Carlington! Nestled in the heart of the city, Carlington is a community to watch. This neighbourhood has lots of amenities along with easy access to the Queensway making travel within the city a breeze. Situated just a stone’s throw away from the pricy Island Park, Civic Hospital, and Westboro neighbourhoods, Carlington has similar charm but is far more affordable. Carlington is located in the River Ward in the west-end of Ottawa and it is bordered by Clyde Avenue to the West, Carling Avenue to the North, Fisher Avenue to the East, and the Central Experimental Farm to the South. The area features a variety of different style homes with most being built prior to 1980 but you will also find brand new homes that are taking the place of smaller war-time homes on larger lots. As the Westgate development begins, Carlington will see extensive growth in the near future. “The area consists of many different style homes, on generous sized lots, offering something for everyone”, says Jennifer Forward, Realtor with Royal LePage Team Realty. Carlington is an active community with many young families and is a great place to buy a starter home. The largest segments of the population falling in the age range of 20 to 44 years old but there are people of all ages that call this community home. 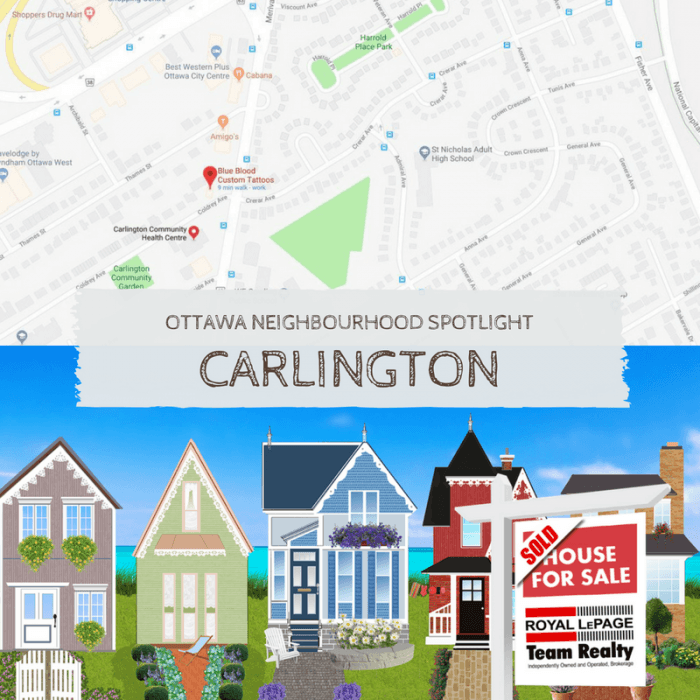 “As a former resident for 12 years, current owner, and having sold many homes in the neighbourhood, I feel that Carlington is one of Ottawa’s best kept secrets,” says Forward, “Carlington is a great place to live and offers excellent value”. With neighbouring communities becoming out of the price range for many buyers, Carlington is seeing steady but reasonable growth in property values. With the average price sitting around $400,000, this neighbourhood provides great properties at a more affordable price point. Enter this well-located neighbourhood, and enjoy easy access to everything you and your family may need. Situated close to 2 hospitals, schools, community centres, and shopping, Carlington has many amenities to offer. This area features a very active community association, and you don’t want to miss the annual “Carlington Family Fun Day” held every May! As summer begins, join this community at one of the best-shaded splash pads in the city at Harold Place Park! The neighbourhood itself offers a warm country feel, thanks to the Experimental Farm being right at your doorstep, which boasts lots of trails and bike paths to choose from. Quickly arrive at beautiful destinations such as Dow’s Lake, the Arboretum, and the Canada Agriculture Museum. Explore these beautiful locations, and enjoy dog walking, biking and an assortment of available activities. Bowman’s Bar and Grill – Self proclaimed as “your neighbourhood restaurant with a great selection of familiar food done well” and this family friendly restaurant does not disappoint! Raven Street Studios – Constructed in 1992, this facility remains Ottawa’s largest and most established recording complex. Burton Cummings and Randy Bachman, Avril Lavigne, Snoop Dogg, Train, and Collective Soul have all recorded there! House of Lasagna – This authentic Italian eatery is known for its lasagna and pizza! Eat in, take out or delivery! Timberware Handcrafted Furniture – If you are looking for a beautiful and rustic wood piece for your home, these guys have you covered. Check out their amazing projects! If you’re interested in homes for sale in Carlington or you would like information on property values or current market reports on this or any other neighbourhood please contact us! We are always here to help.